Thirty-four years before the New York subway was first opened to the public, another underground railroad was secretly built beneath Manhattan. 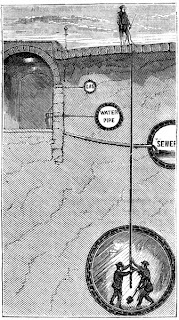 Today, most New Yorkers are unaware of its existence, but parts of Alfred Ely Beach's pneumatic subway may still lie under the streets, waiting to be rediscovered. Alfred Ely Beach was an inventor, lawyer, and newspaperman whose offices at the New York Sun looked down on the streets of Lower Manhattan. In the 1860's, traffic in the city was worse--and far more dangerous--than it is today. Pedestrians who dared cross the crowded roads were often trampled by horses, and traffic jams regularly paralyzed the city. Add to this the fact that the garbage piled on the streets and sidewalks could reach knee-deep (horses contributed four hundred tons of manure a day), and you can see why a genius inventor might look for a solution below ground. Unfortunately, at the time, New York was ruled by a corrupt politician named Boss Tweed. Nothing was built in New York unless the project lined the pockets of Tweed's cronies. So rather than pay "political blackmail," Beach decided to construct his subway in secret. He and his brother rented the basement of a clothing store on Broadway and started to dig. Every day, workers would bore through the earth, and each night, other men would furtively cart the dirt away. In 1870, Beach opened his subway to unsuspecting reporters, politicians, and members of the public. Beneath the basement of a house on Warren Street, they found a lavish underground waiting room, complete with frescos, a fountain, flowers, a grand piano and chandeliers. Then they were allowed to ride--ten at a time--in a richly-upholstered car which was blown through a 312-foot tunnel by an enormous fan. Beach's subway was a sensation for months, but he never received the city funds he needed to extend it. Ultimately, people stopped visiting, and by the 20th century, it was largely forgotten. When workers happened upon the tunnel in 1912, they had no idea what they'd found. Then they discovered Beach's tiny train, still sitting on the tracks. It was New York's first abandoned subway station. But that politician is a thickhead, no doubt about it! Oh, and to Ananka and to whom it may concern: I started a forum (finally!) I'm still trying to get a hang of it and am aware that there's an age limit so, don't tell anyone I said this but I tricked it which is all well and good if you're under whatever it's age limit is but you should be able to remember it so I'd recommend round numbers. And remember, I did not just tell you that. You can find the forum here. Same difference, whatever. School projects these days, ugh. PS- according to the gothamist labs' NYC Map, there was a large sinkhole at 3:14 NY time on 187th PI and Jamaica Ave, Queens, NYC, NY. Made me think of the shadow city.